Hump Day AND National Waffle Day?! Treat yo’ self [or better yet, have your honey to wake up and treat you]! Check out the recipe below for Martha-Stewart-approved, WICKED yummy waffles. 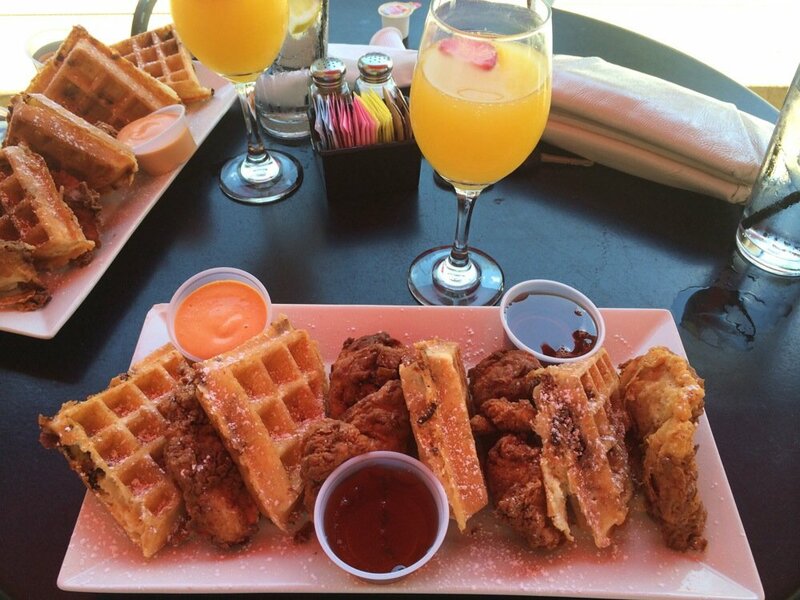 What’s the best way to enjoy your waffles? With Mimosas… of course. If you’re on vacation, indulge away. If not, hold onto this recipe until Sunday. Your boss will thank you. Maple-Walnut Sauce/Blueberry Sauce/ Banana-Caramel Sauce or maybe even a Berries-and-Cream Topping! Pick whatever suits your fancy to garnish the top of your fluffy treats! Preheat oven to 275 degrees; place a cooling rack on a baking sheet, and place in oven. In a medium bowl, whisk together flour, sugar, baking powder, baking soda, and salt; set aside. In a large bowl, whisk together buttermilk, butter, and eggs; add flour mixture, and mix just until batter is combined. Heat waffle iron according to manufacturer’s instructions; brush with oil. Pour batter onto iron (amount depends on iron size), leaving a 1/2-inch border on all sides (spread batter if necessary). Close iron; cook until waffles are golden brown and crisp, 3 to 5 minutes. Transfer to rack in oven to keep warm; repeat with remaining batter. 1/2 cup strawberries, thinly sliced Ensure both ingredients are well chilled, mix into the glass [make sure you stir, not shake!] and serve beside your tasty waffles! Stay tuned for more tasty treats, event announcements and swag giveaways, and don’t forget to share your recipes with us! 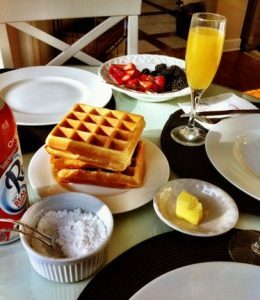 This entry was posted in Recipes and tagged Breakfast, Brunch, DIY, Drinks, Global Wines Inc, Mimosas, National Waffle Day, Quick Recipes, Recipes, Waffle Wednesday, Wednesday, Wicked, Wicked Wednesday, Wicked Wines, Wine. Bookmark the permalink.